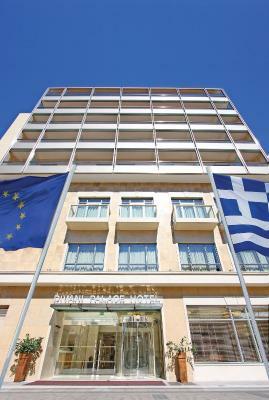 Lock in a great price for Divani Palace Larissa – rated 8.3 by recent guests! The staff are are all friendly and knowledgeable. They helped us get parked and offered us many options for visiting the city. The hotel is located on one of the many pedestrian walkways so be aware that it is OK to drive (slowly) on the pedestrian only walkway to check in and get the parking information. The breakfast buffet was extensive and the coffee was delicious. The room was a perfect temperature. Hotel as described on the website - clean and comfortable. Air-conditioning in room worked well. Very good location in the city centre with a pedestrian road outside. The breakfast was amazing with really wide selection. The staff were polite and helpful, promptly calling taxis and arranging for an emergency printout of a speech. Check In and Out were fast and efficient. The service in the restaurant both at dinner and breakfast was exceptional. The room was quite spacious for one person, although not for two. The bed was hard but comfortable. There were plenty of plug points, and the flat screen TV was fixed in a logical place. Location,staff.Rooms are large as should be in five stars hotels and with good view.Breakfast offers everything you want. The bed was the most comfortable I have slept in out of all other hotels. Very good breakfast! Hotel located in the centre of the town. We have used it more than once over the years and we have never been disappointed. Very good breakfast. Divani Palace Larissa This rating is a reflection of how the property compares to the industry standard when it comes to price, facilities and services available. It's based on a self-evaluation by the property. Use this rating to help choose your stay! One of our top picks in Larisa.Located in the heart of the commercial center of Larissa, the historic Divani Palace Larissa offers 5-star accommodations featuring a spa center, a gourmet restaurant and a bar. 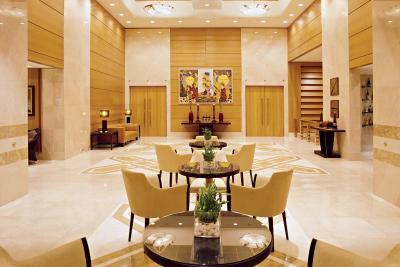 Rooms and suites at Divani Palace are tastefully furnished and open out to private balconies. They come with a TV, mini-bar and air conditioning. Free toiletries and a hairdryer can be found in the bathroom. At the restaurant, guests can enjoy international and local flavors in a refined setting. 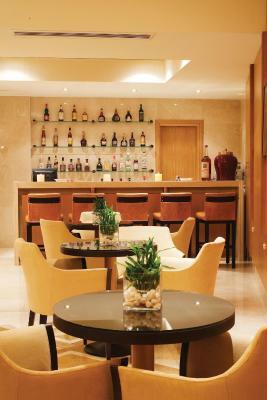 The stylish bar is ideal for enjoying a drink or a cocktail. Room service is also available 24 hours a day. 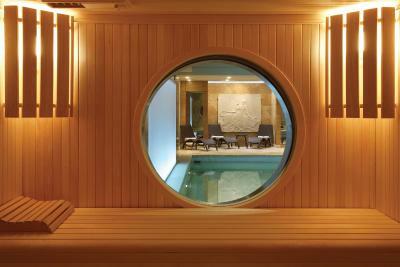 Relax and unwind at Larissa Spa Center featuring an indoor pool, a steam room and a sauna. 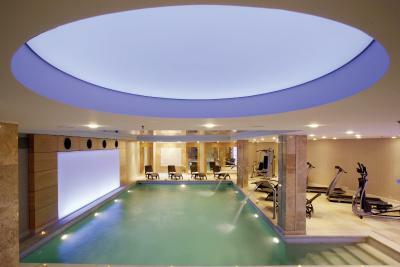 Beauty treatments and massage sessions can also be arranged, while a fully equipped gym is also featured. Within 25 mi, guests can visit Mount Olympus and the castle of Platamonas. Nea Aghialos Airport is 35 mi away. Free internet access is available throughout and private parking can be found nearby. 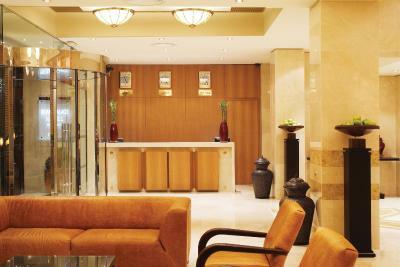 When would you like to stay at Divani Palace Larissa? 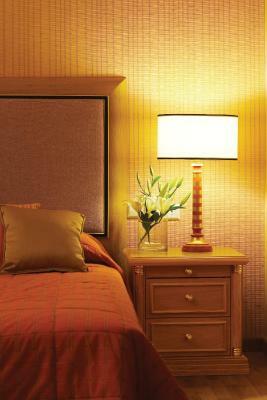 The deluxe rooms are decorated with pale colors and come with a TV and free toiletries. These luxurious suites feature Italian furniture, beautiful paintings and come with a TV and free toiletries. This room is located on the upper floors with large balcony and view of the city or the ancient theater of Larissa. It offers bathrobes and slippers, free internet access throughout the property, free parking and late check-out until 17:00. This suite has a balcony with city views and a flat-screen TV. 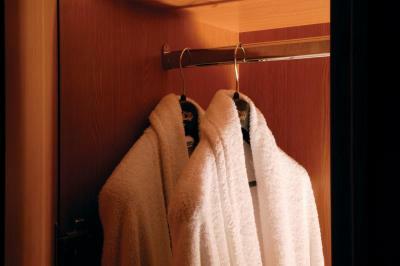 Featuring bathrobes and slippers, the private bathroom also comes with free toiletries. Divani Palace Larissa hotel, ideally located at the heart of the commercial centre, just minutes away from the city’s main square and just opposite from Larissa’s ancient theatre, has reopened at the end of 2005 and has become since the new luxurious meeting point in Larissa. House Rules Divani Palace Larissa takes special requests – add in the next step! Divani Palace Larissa accepts these cards and reserves the right to temporarily hold an amount prior to arrival. Pool operating hours are from 12:00 to 20:00 daily. The pool remains closed on Sundays. 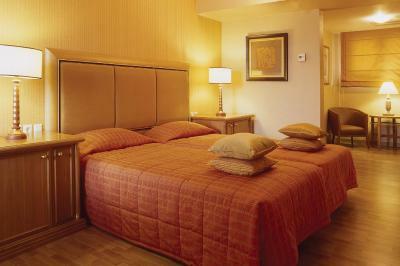 Divani Palace Larissa is a pet friendly hotel, welcoming dogs of maximum 4kg/ 9pounds. Fried eggs were dried out (the yolk overcooked). It didint feel like a 5 star hotel. At the hotel info the pool is supposed to be for free although it's not. The room smell cigarette from past visitors. Pleasant view, clean, services, pool, quiet. The noise cancellation is really bad, you could hear the clubs in the nighttime a lot. There is no free parking also offered by hotel. 1. The room was gloomy and drab - the decor belonging to another age and in shabby condition (see pics of dirty, wonky lamp, ripped chair fabric) with one of the worst views I have ever experienced (see pic). The bathroom was pokey, with a plastic shower head and an extractor fan that had clearly never been cleaned (see pic - disgusting!). 2. No slippers were supplied. Toiletries were limited and the bath gel (hotel's own brand) had a frankly unpleasant odour, somewhat reminiscent of hospitals. 3. The wi-fi signal was pathetically weak - the connection kept failing which was especially irritating as I needed it for work and had clearly stated I was there on business. 4. Breakfast was satisfactory for a 4-star hotel but poor in choice and quality compared with that provided by other 5 star hotels throughout Greece. 5. The bar in the lobby is uninviting, poorly stocked and actually resembles the sort one might find in a cafe neon. 6. The food in the restaurant is of reasonably good quality but the wine list is minimal - basically, if you don't like Tsantali, you need to dine elsewhere. I was the sole diner there that evening (between 8pm and 9:30). In general, I was disappointed with my stay here and felt that I had been to some extent ripped off. Until management decide to bring it into the 21st Century, in my opinion, a hotel to be avoided. Did not notice anything we did not like! The reception staff were exceedingly helpful in helping me track down my purse when I left it on a bus! They were so kind and helpful and succeeded in reuniting me with my purse. Thank you. It was a nice hotel , but unfortunatelly there is a big cellular tower with many antennas and signal amplification units right across the hotel.You have to sleep with the cellular tower a few meters away from your head/window ,which is dangerous because the radiation level is above the safety limit.